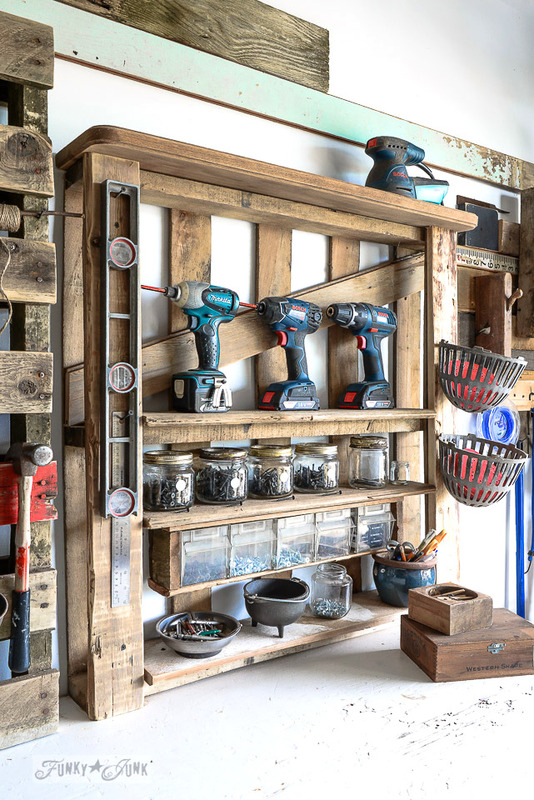 Do you dream of having this perfect little workshop in your own home? But lack space and funds to pull it off? 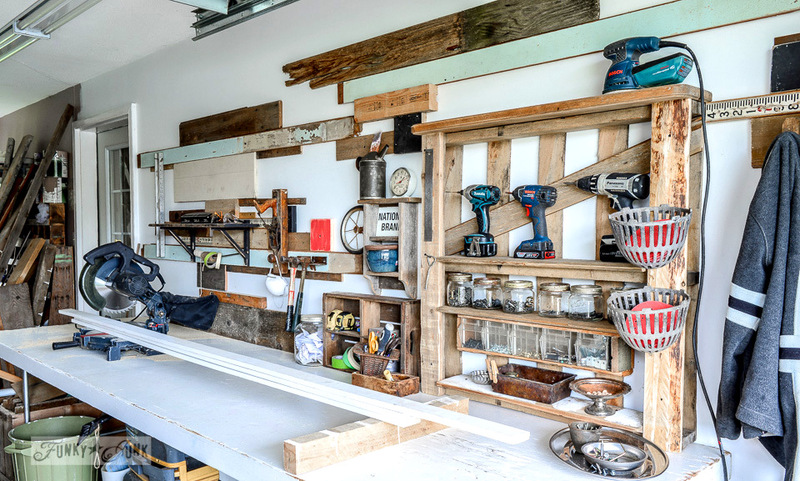 You’re about to see my dream workshop in a garage reveal, created for free from all curb side finds! I’ve long desired a workspace that was absolutely me to a rusty ‘ol T. My ways are not the ways of most. And I’m ok with that. So over the next 31 days, I’m going to take you on a little journey with me. * I’m going to show you the kinds of things that make me afraid, and how I punch through them anyway. * I’m going to show you how it’s possible to get excited about boring things. * I’m going to show you how hardships are actually the beginning of your own unfinished story. 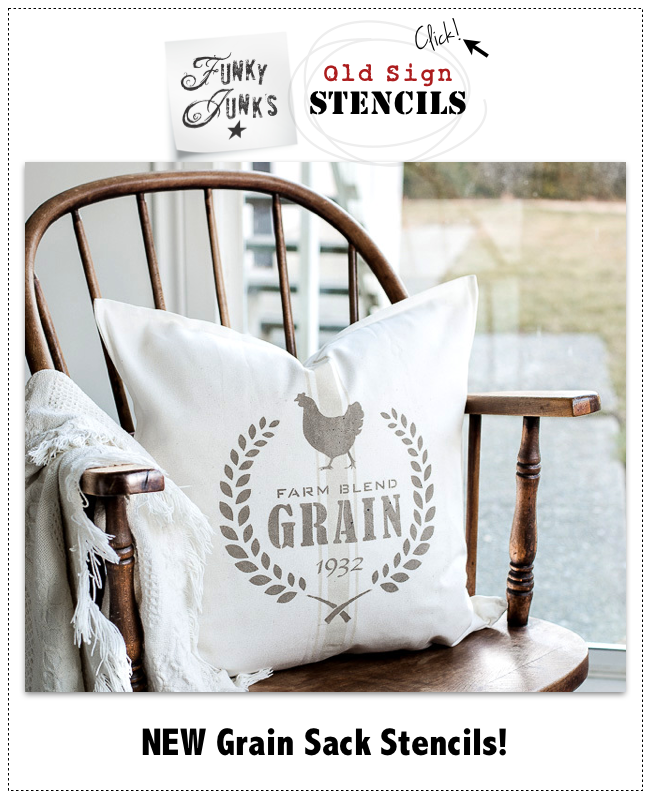 All through home decor. Crazy talk, right? Thing is, I truly believe, we all start with this empty box, that is waiting to be filled with you. The real you. Happiness is waiting! Are you ready? And my new workshop is the perfect launching pad. The wall had been painted white and my long awaited tables set in place. I kid. No wonder I didn’t want to build much. ahhhh.. light, bright and pretty junky if I do say so myself! And no more fold out costco tables! Love the wooden table beauty found from the curb! And how funky is that wall? Remember that pretty aqua wood I picked up off the curb? I wanted to show case some of it in a special way and now I get to look at it every time I build. A plain little shelf you saw here got distressed like crazy, then painted out and waxed. 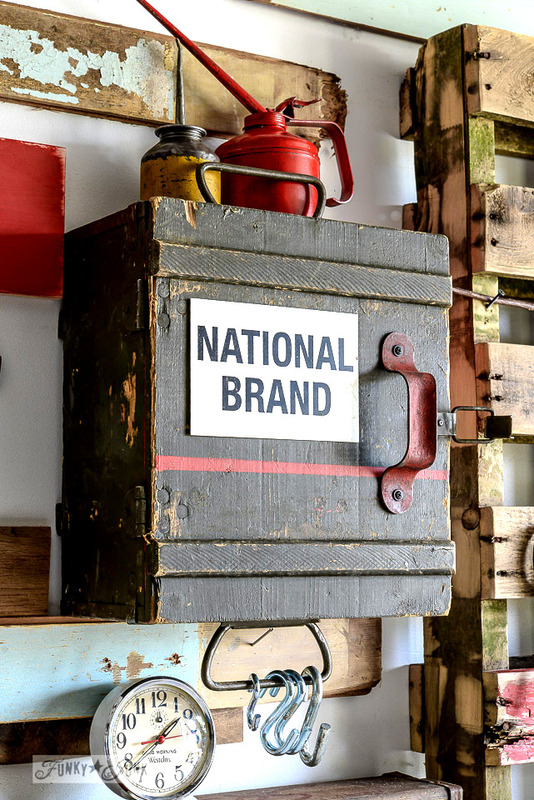 I’ll show you how I did that in another post… I came up with a super cool way to get it good and banged up! A little branch holds the yarn and masking tape. I even tried it out tonight. It rocked! Finally! 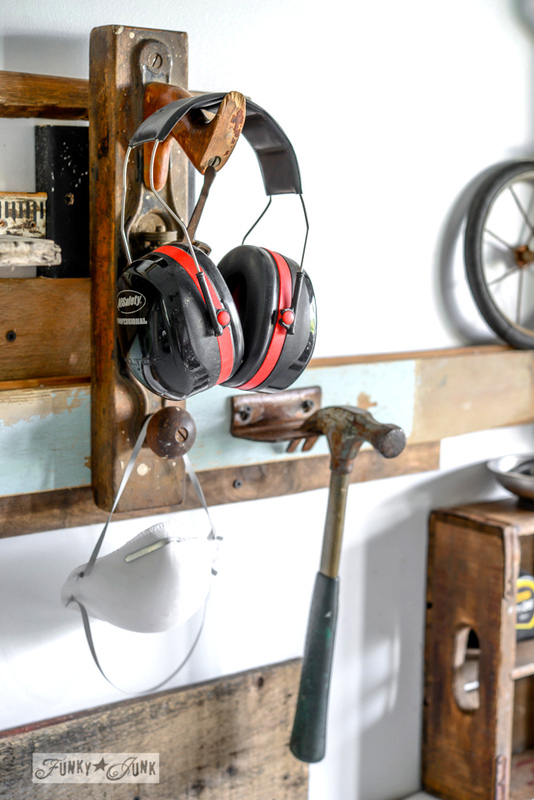 My hearing and breathing protection is near my saw, hanging off an antique wood planer. 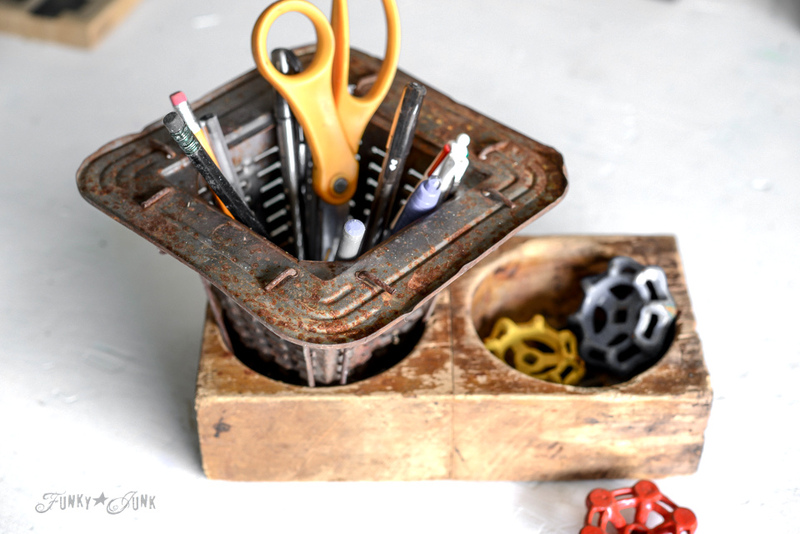 Even the storage fixes are made from reclaimed things. 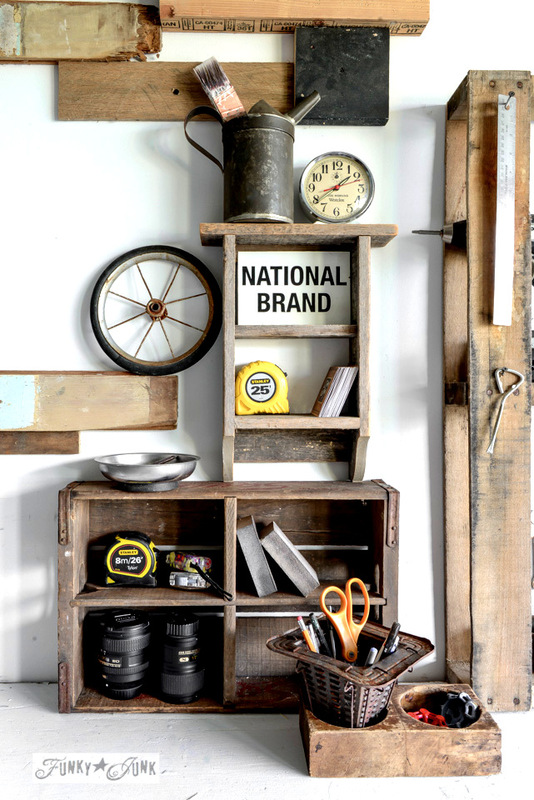 A soda crate was the perfect little office / tool organizer. Can you guess what that pen holder is? It’s a vintage toaster. No. It’s a DELICIOUSLY RUSTY vintage toaster. 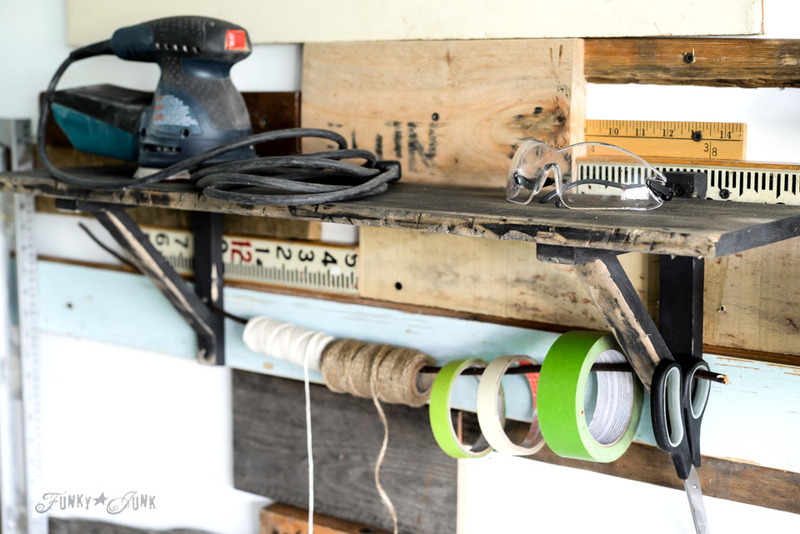 This little pallet shelf was pretty perfect for my collection of cordless drills and screws. 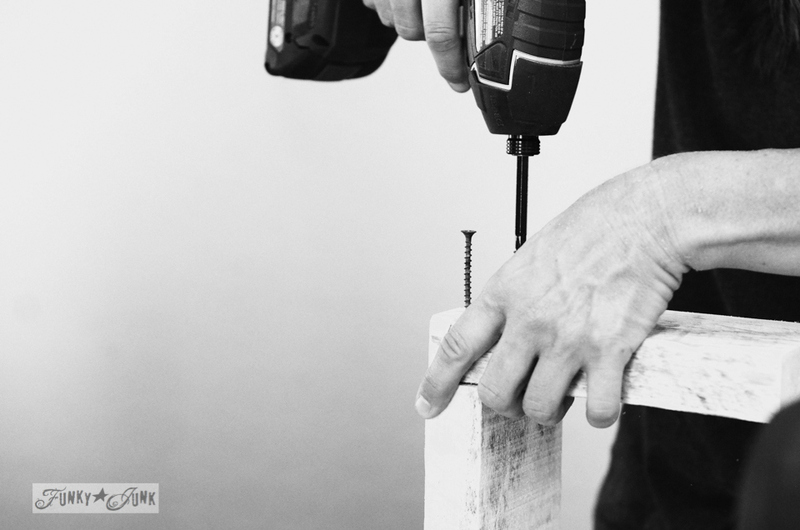 If you’d like to know more about the kinds of tools I love to use, visit 5 DIY must have power tools HERE. Now WHY would one bury all that beauty in a toolbox cabinet when you can admire them all the time? 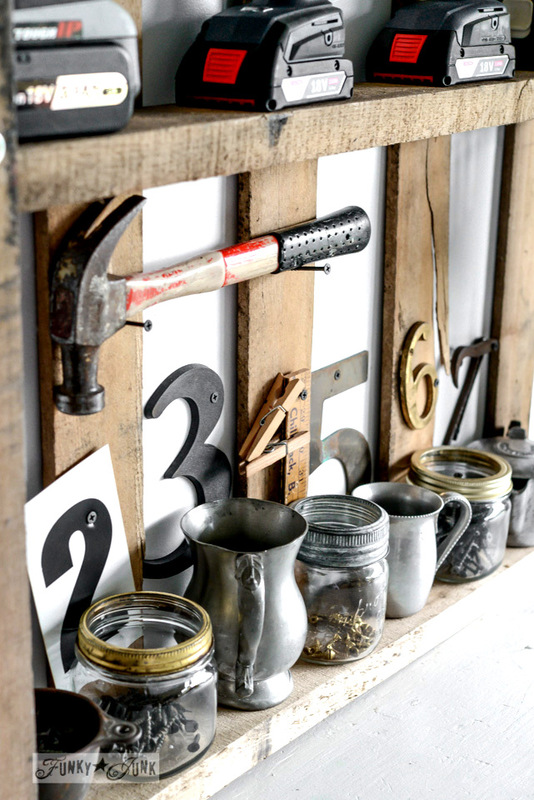 And this little ensemble of mason jars, and stainless creamers and cups holds all my favourite screws. Lined with mismatched numbers for a little junk zing. Zen? Both. A couple of antique drain covers were perfect for the bulk sandpaper. Now… what’s going on here? Hmm… wall art? Pauline from My Altered State, I was channeling a junkier version of you here! With hooks for keys, hanging coats, rags, keys, and maybe a new shop broom. I like that idea! Or the sawdust brush. Perfect. This little crate came into play later. I LOVE hanging crates as shelves! 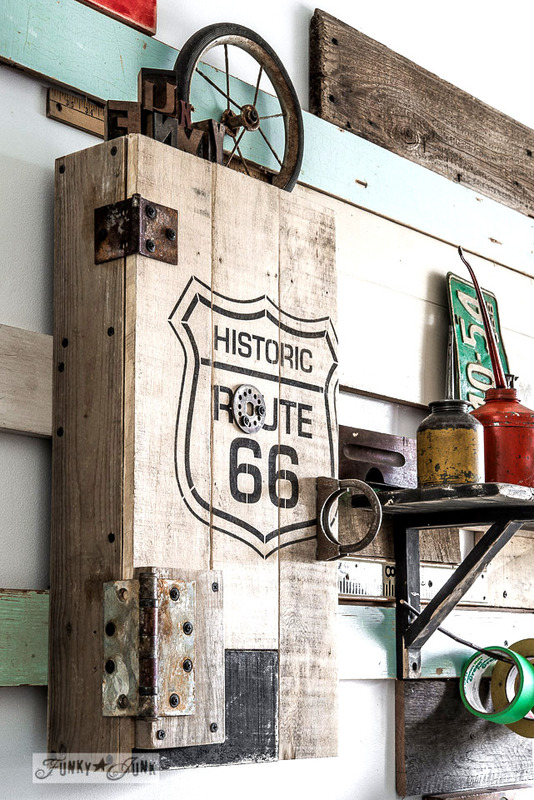 I got the greatest gratification from finding great curbside things to store reclaimed wood. Aren’t they perfect? I also created a rolling shelf under the main worktable. It allows me to push the table closer to my work station when needed, without carrying the load underneath. It’s very effective! Underneath the table, I had a stack of tiles that were just too heavy to move. So I created a faux crate around them instead. 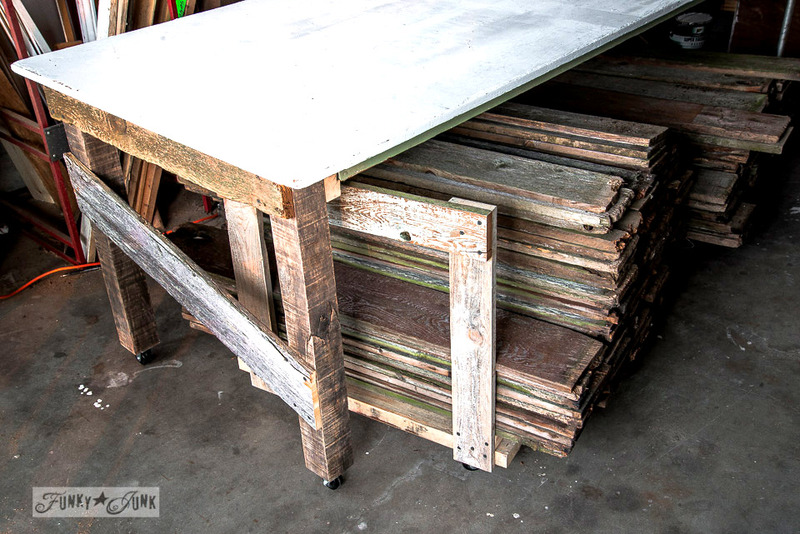 This post also includes tips on how to stack reclaimed wood to get the most room possible. I’m so in love with this little crazy train workshop area. It offers everything I need, in a weird, yet kinda wonderful way. Now all that’s left to do.. This project isn’t quite done yet. More will come soon and be added to this post as it is completed. 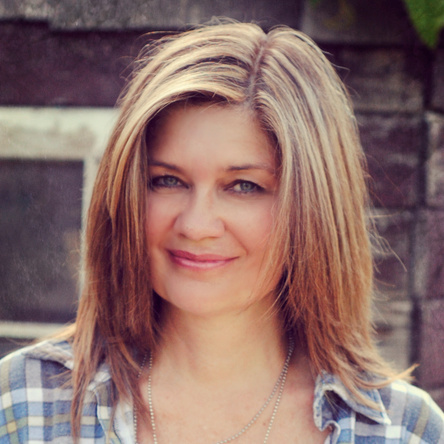 Have I encouraged you to get out there and see what you can do with the space you have? See all instalments to date of dream workshop 2014 HERE. Love how your workspace turned put! Perfectly junky!! I love the mix of colors and pattern on the wall. Looks awesome! 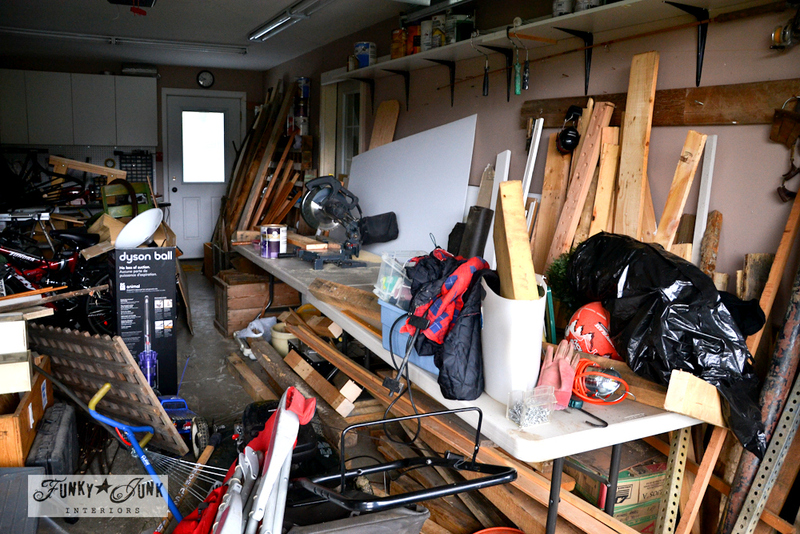 Ok I’m inspired… my basement workshop looks very much like your before picture. I’ve got to get busy, pull everything out of there and start from scratch. sweet! I’m sure it will inspire to create even more! 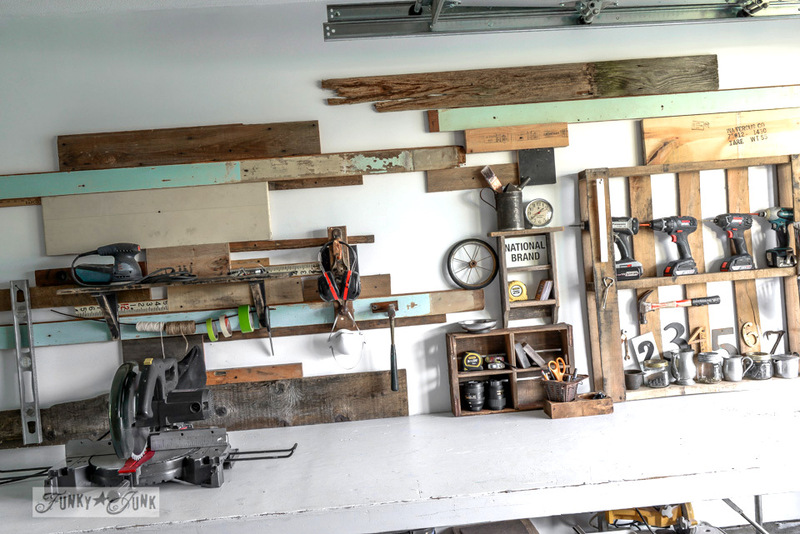 I love this and am going to show my husband what our garage could look like! It looks great! What an “awesomely” inspirational work area! I’m just working on getting back to my tools in the garage. (Took quite a long vacation from it bcuz of the job I had.) Can’t wait to get it all cleaned up & ready to use. I’ve already ordered new tools – just got my Kreg jig last night! Can’t wait to use it today!! Sure enjoy reading your blog – keep inspiring! Wow…I love it. 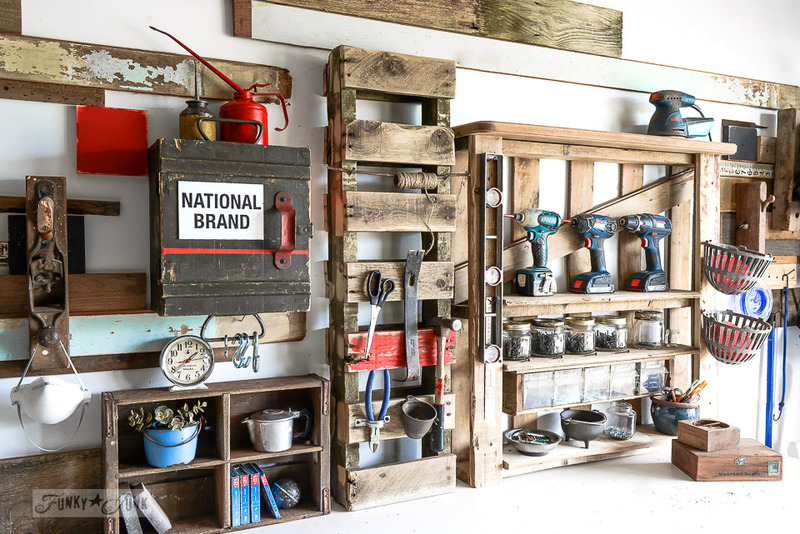 I especially love the pallet with the drills on the shelf. Everything is so unexpected and works perfectly. Brilliance! That’s the best word I could come up with for how fantastic your wall is. 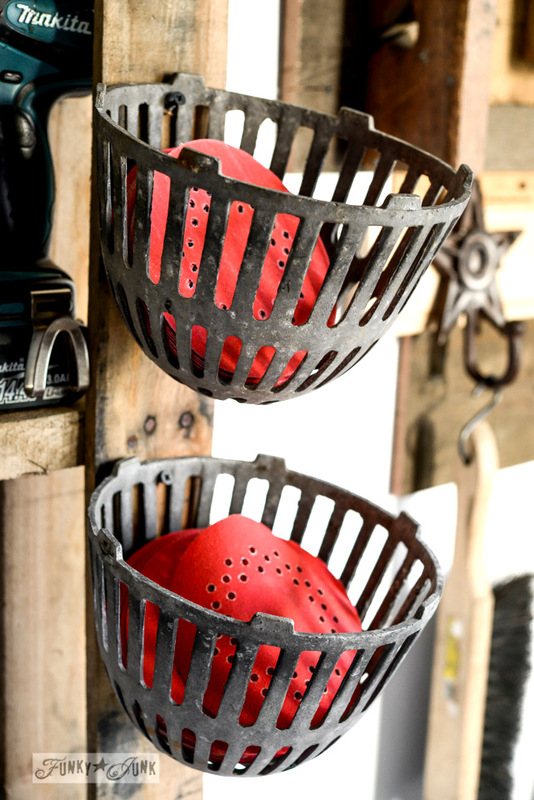 You get an A+++ for your constant use of repurposed items. I see your a Bosch drill fan too. I love mine so much I bought multiple also! And the surveyors measuring stick — love. I’ve chopped up and used the few I’ve found in projects. They always pop. I can’t imagine why this post won’t get 100 comments soon. You go girl! Looks great – of course! But my problem is I wouldn’t be able to reach anything across the table and up the wall. Would need all my small stuff to be to the sides of the table. You’re blessed in height if you can reach all that! But yep – looks super great! Donna, This really blows me away. I recently read your whole story and I find your approach impressive, inspiring and quite unique. Kudos to you because you really have some special skills. I’m much more of a stylist/artist/decorator than builder, so I’m fascinated by things I’d just have no idea how to do. 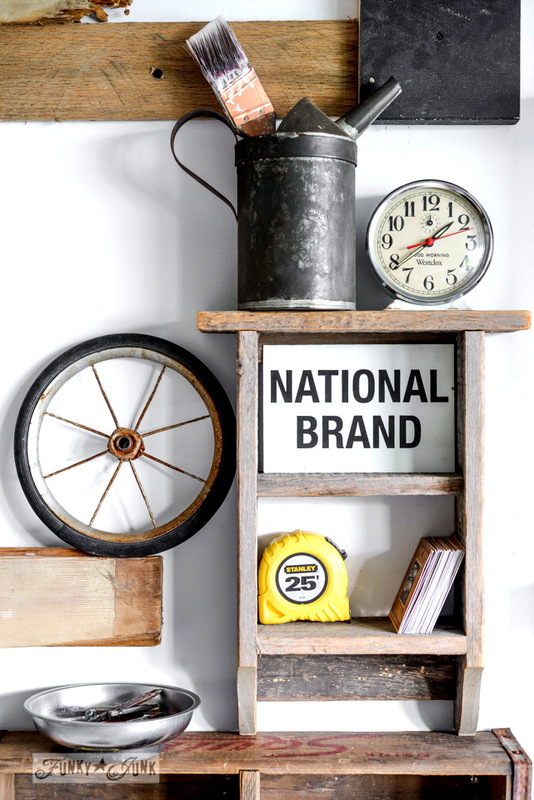 You’ve got a great eye, a knack for bringing things to fruition and a style all your own. Really enjoyable to observe! 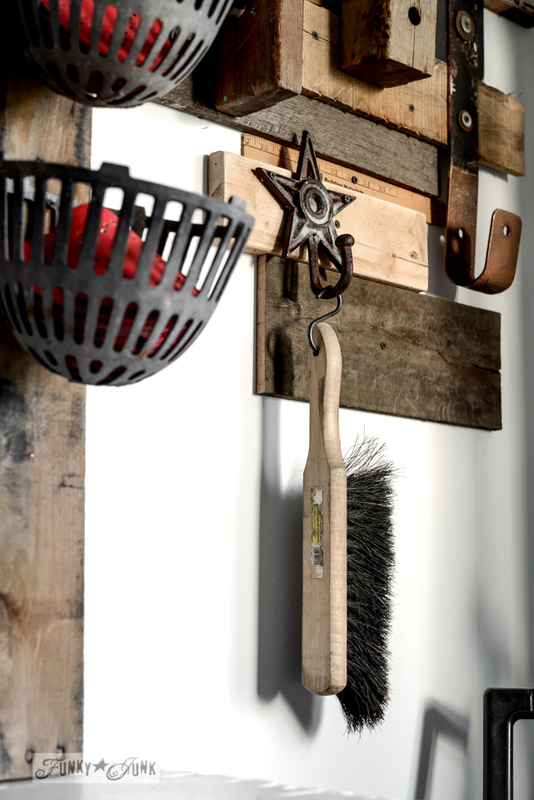 You’ve got a great eye for organized clutter. It’s beautiful! Totally fab, love it, love it, love it!!! Now THAT is progress, I’d say! Your workshop looks uniquely amazing. I adore it! It’s fabulous and so you! Donna – I could read (hear) the giddy in your words! Your cordless drills all lined up in a row is priceless! What a wonderful space you have created! Happy creating! Love your awesome work space! Perfect! OBSESSION not possession! Yeeeeesh! I can’t type right these days!! I love it! Can’t wait to see what’s next. Any tips on how to inspire my husband to clean up his work space??? Your’s looks so neat and organized. 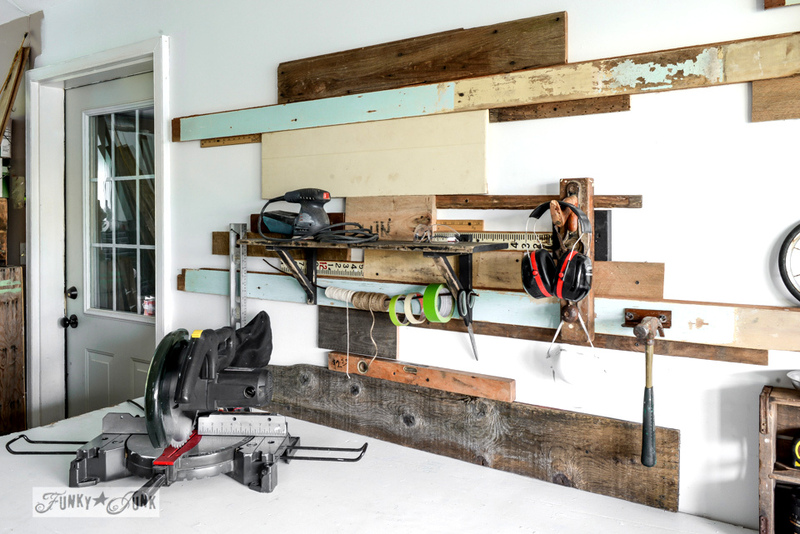 I love how you used the pallets and all the neat ideas you have for storage. 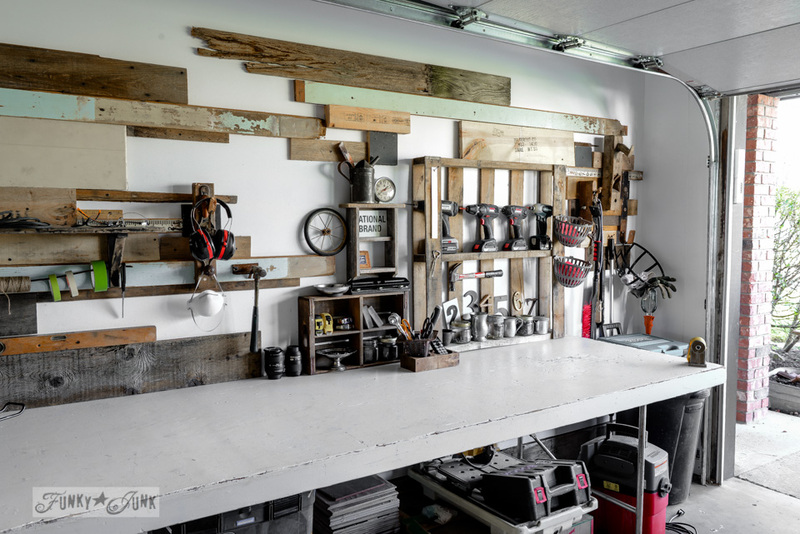 Shop is totally unique and I am liking it tons – giving me added ideas for my own.. Have a super safe creative time in your workable wood shop..
Wow, that looks terrific. I hope when I’m in my new house that my work space looks half as cool! You are awesome like that Donna! It looks great. Love this Donna! 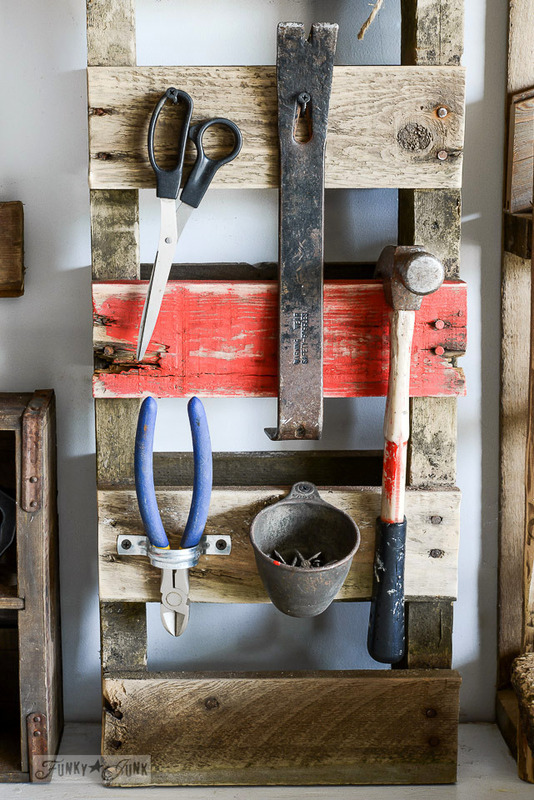 A perfect way to make a beautiful and inspiring space for all those tools! You have created a wonderful building space! I like it because it is made with all your resources you had on hand, it’s really great. I too love to build it makes it so darn easy when you have a place like this to create a little something special. When I see work spaces that have all new this and that I turn the other way! Happy Building! Lisa @ Sweet Tea N’ Salty Air. Oh boy, this is perfect! You’ve just solved a huge problem for me… I’m going to make all my *stuff* work for me. 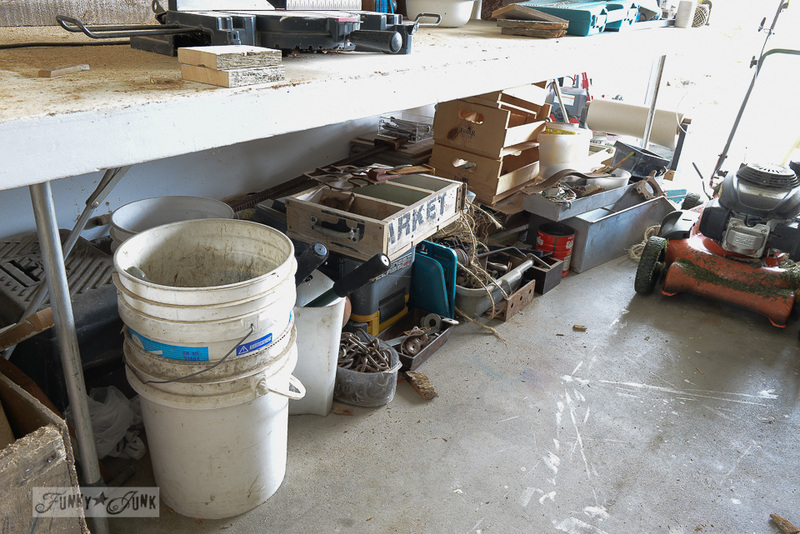 Meaning, I’m going to use stuff to hold and organize more…well, stuff! time to make my corbels HOLD a shelf, instead of sitting on one. Thanks Donna! You inspire!! YEAH!!! Can’t wait to see what YOU do… because it’s gonna be spectacular! I’ve been following along since I found you about a month ago, loving your junky style. I’ve been working on some of that myself! 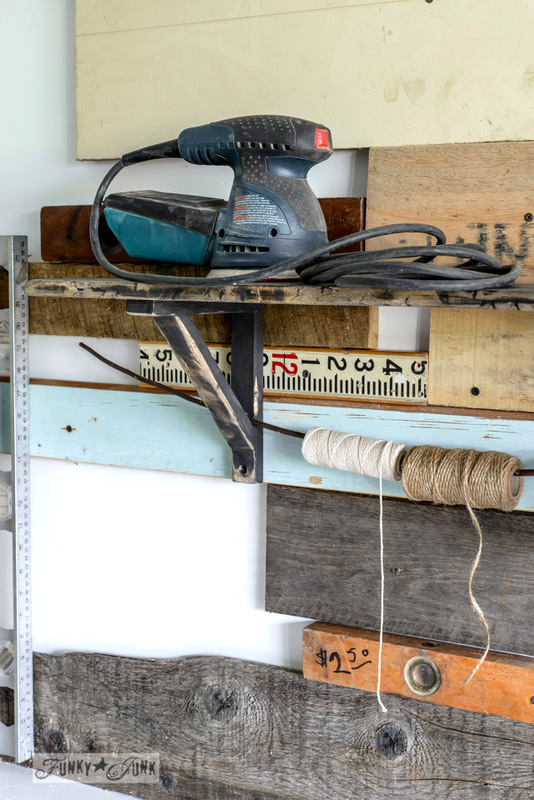 Your workshop is a dream and I would love to come make some fun junk with you! Right now I a invading my husband’s space in the basement! So glad to see you were doing 31 Days as well in this category. Can’t wait to see what everyone has to offer! LOVE your creativity! Your space looks amazing. The numbers are my favorite! What a beautiful way to be organized! 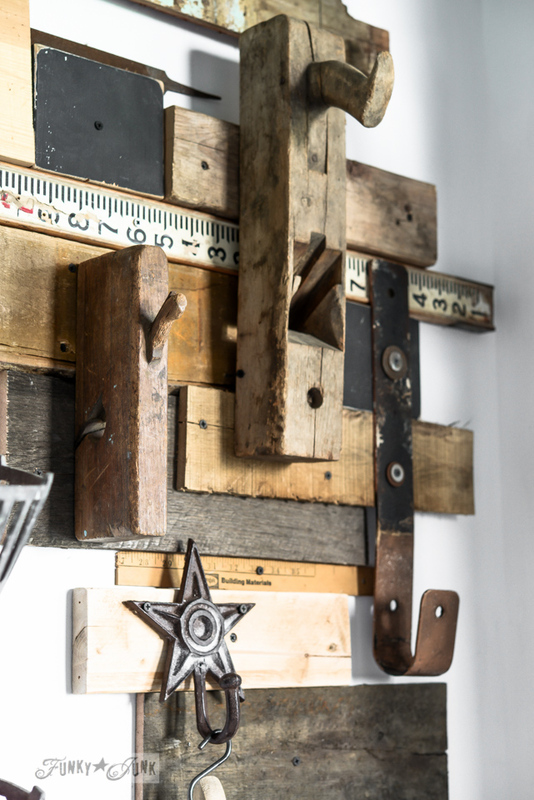 Your ability to take what most consider to be junk and repurpose it into a functional work of art is priceless! Oh, Donna…. you’re white box metaphor and everything you said about our story and being ourselves made me a little teary eyed… in a good way. Your workshop looks great! And I can’t wait to see the rest of the white box challenge unfold. XO! I love your new area. I used to have a fantastic shop in my garage till we moved, and now it is in the basement. Loved the garage more because with the doors open I could see nature. Lol! How many drills can one person have?! Your workshop looks fabulous! Oh my gosh! Am I ever glad I popped in! 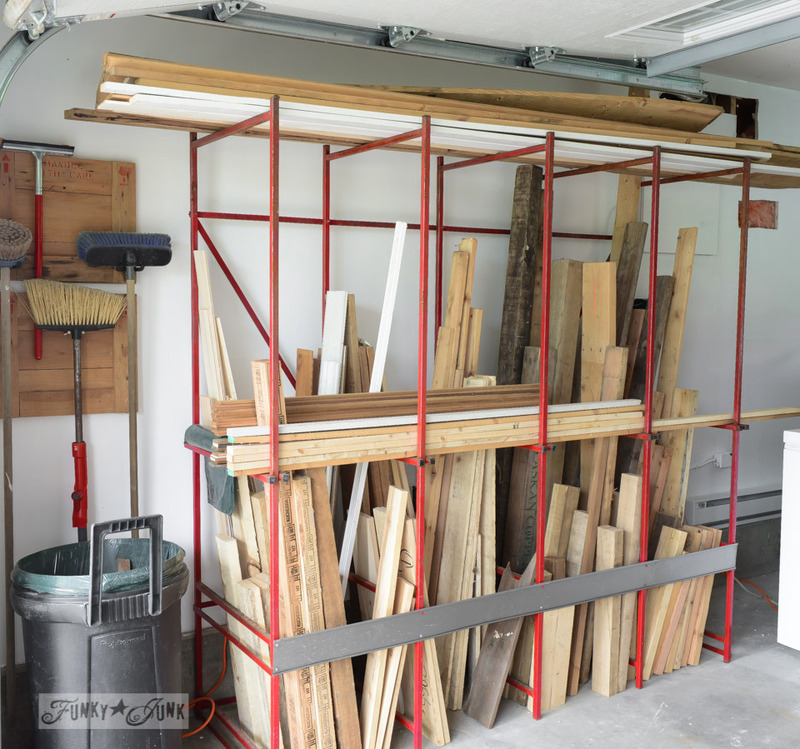 I started cleaning my basement woodshop a couple weeks ago and became so overwhelmed, I haven’t revisited it but I soooo want to do some woodworking like I USED to. After all, cold weather is coming soon and what better place to be than in the wood shop?! 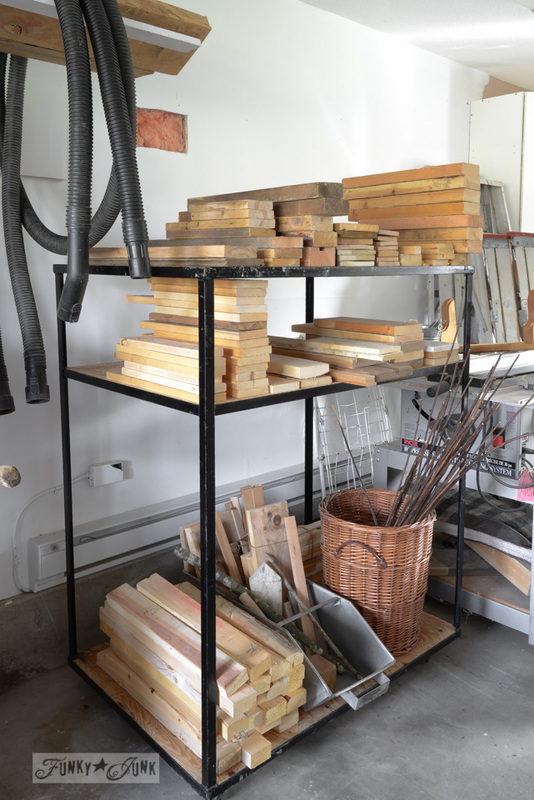 You’ve totally inspired me to make cleaning and organizing my woodshop part of my 31 days of writing!! I love how you have everything organized and the look of your blog! LOVE. LOVE. LOVE. 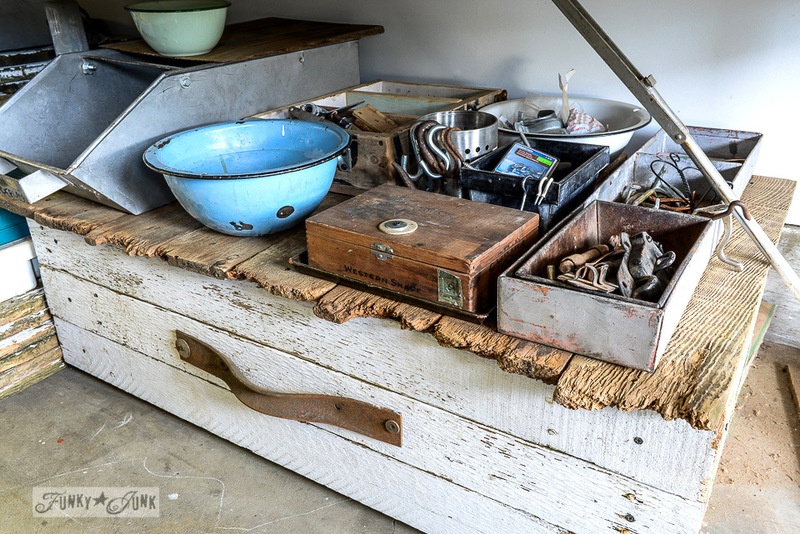 My workshop is a mess and I am already remembering some treasures out there that need some attention! You’ve caused me to see rusty tools and things in a very different light. Love those numbers…especially the 4. Maybe I haven’t done a thorough enough job of exploring your blog and the info is there. But I’d love to hear more about the workshop that helped you discover what you should be doing. Is it available online? I’m in a “transitional” period now and feeling a bit lost. Sure could use a “map”! Thanks! I have forgotten what the course is called, so I’ve summoned for some help. I’ll find out the name and hopefully their artinerary of travel. I’ll include the info in another 31 Day blog post so stay tuned! I love your junky style so much. The drain covers are great! Talk about a custom look! 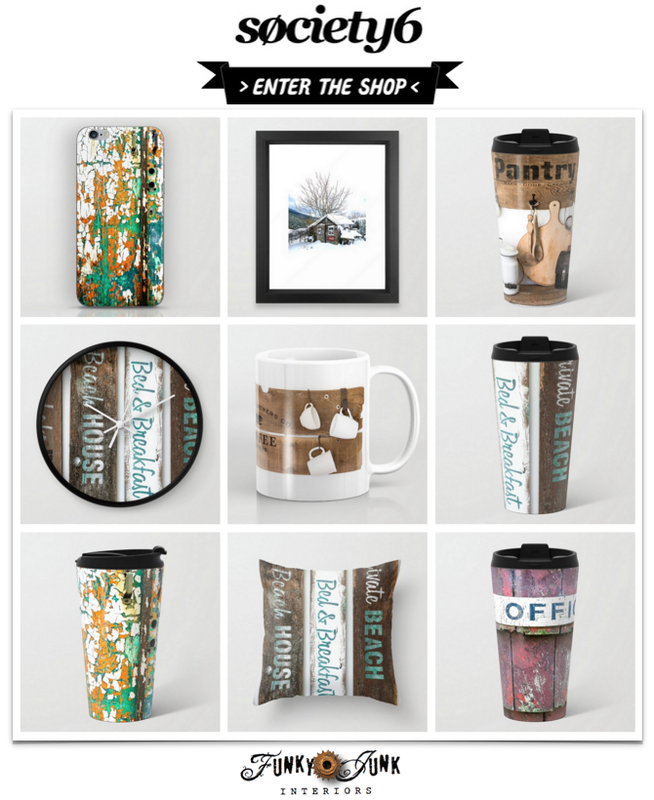 It is a perfectly scrappy, funky-junky place to work and create! So you. More than anything. It’s what YOU like. It is a creative spark and jumping off place for YOU. I know you’ll encourage others to create their white box into their own space too! You did an awesome job! I wished my hubby would clean his messy shop up! But that’s his territory, not mine. I need to make some changes in my craft room Then he can have my metal shelving for his shop. But, you did an awesome job. I’m speechless and that rarely happens!! I think you need to go into the garage organizing business and I can be your first client. I love every detail! 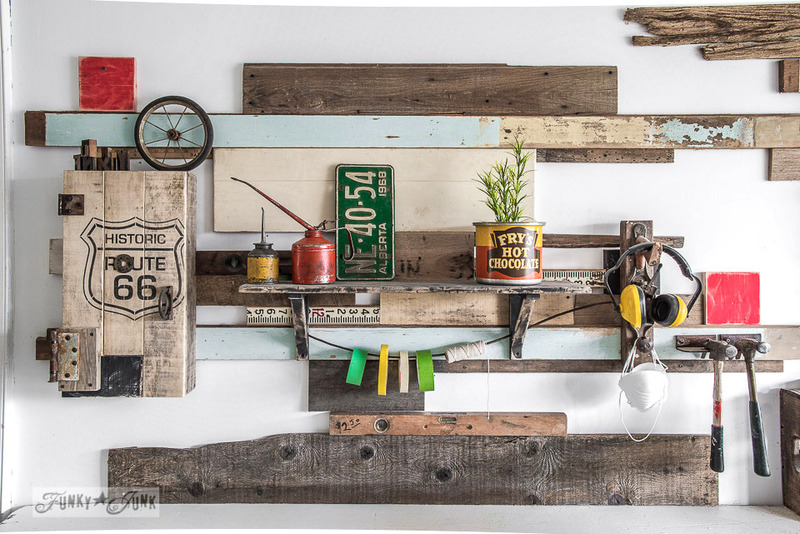 Hello, how do you attach the pallet to the wall? Hey Rebecca, the screws holding up the hammer penetrate right through into the wall. The bulk of the weight is sitting on the table. However if I were to install it higher, I’d attempt to locate the studs in the walls and ensure to screw in that area. Another great way is to create a long brace (board running from left to right across the wall) that is attached to the studs, then you can attach anything to that board. I am thrilled with what you have done so far and can not wait to see more. I am on this journey too. Dancing in my craft room is my Box. It has been delayed more times than not but, I am still determined to find a spot for me in this happy world. 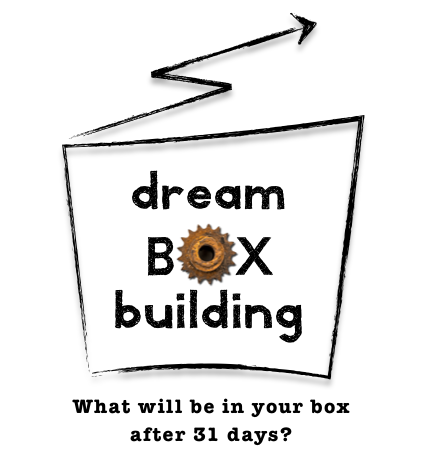 I will be watching you build your dream box. Your workshop looks like my one just mine is not so organized as yours more junk in mine. I’m envious of your workshop and creative skills. It looks like a favorite old workshop that’s been there for 60 years. 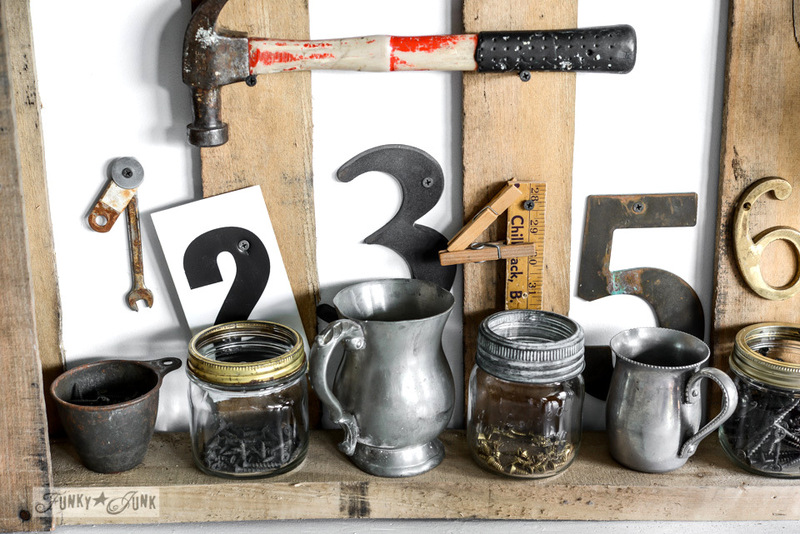 I really like your use of reclaimed wood and misc. hardware. I’ve gotten lots of ideas from your build. Thanks for sharing. Very cute! I wonder if my husband would let me do some of that to his workbench? Awesome! 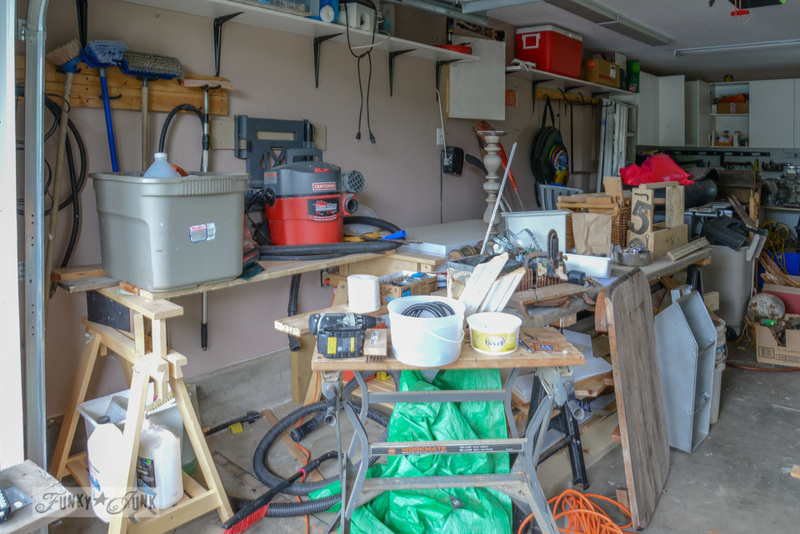 My garage always looks like your before, and I won’t say the after is so cute, because then when I show my husband the possibilities he won’t think of his garage transformation as “cute”. But it’s cute. End of story. Looking at this makes my fingers want to get to work—BADDLY. Itchy*fingers now. Very nice! As always you have inspired me.